United States Navy. 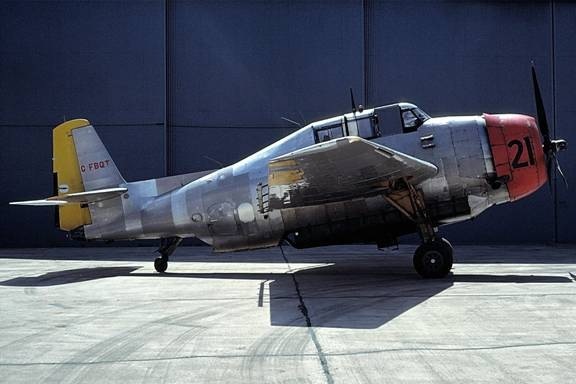 1945 Grumman TBM-3U. Construction #: 4076. U.S. Forest Service, Davis, CA, N107Z, 1956-1959. There are two images of N107Z in this article: “Wings of the Forest Service”. William T. Larkins and Rick Turner, 2011, Warbirds International, Vol. 30 (1):6-19. Registration cancelled 21 July, 1959 (see FAA report). Reregistered as N7858C, #85, Aug. 1959. Owner not known. T.A. Underwood, Buckeye, AZ, 1964. N7858C Tanker #85, US Forest Service, Santa Barbara Airport, California, 1961, Bob Forbes, Early Firefighting. Posted to TBM’s – Mil & Civ, 30 April 2015 by Bob Forbes. N7858C at Parsons Airpark Inc, Carpinteria, CA, 1960s. Posted by Dan Dineen to TBM’s – Mil & Civil. #D17 in Salt Lake City, Utah. Posted by Dan Dineen 1 Dec 2014 to TBMs – Mil & Civ. 1974 – Pilot Godby. 1975,1976 – Pilot Craven. Stored at Ag Air Ltd, Dawson Creek, BC, then (probably) at the Canadian Aviation Hall of Fame (Reynolds Museum complex), Wetaskiwin, AB. FBQT is now at the Pacific Aviation Museum at Pearl Harbour, Hawaii. Images of the newly arrived (early December 2017) avenger can be seen in this article. FBQT at Wetaskiwin, Alberta. 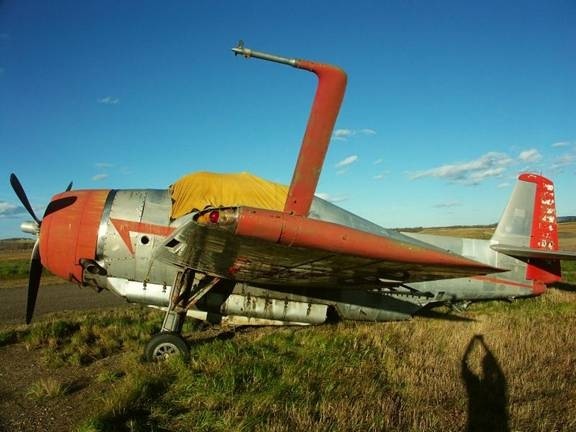 Shaun Scandrett has posted a photo gallery of this aircraft at PBase. [FBQT] was operated by AgAir, Dawson Creek, BC, fitted with a 1000 US gal spray tank. Sold to Boyd Wilson (unfortunately no relation) of Fort St. John, BC, and was trucked from Dawson Creek to Fort St. John for restoration. 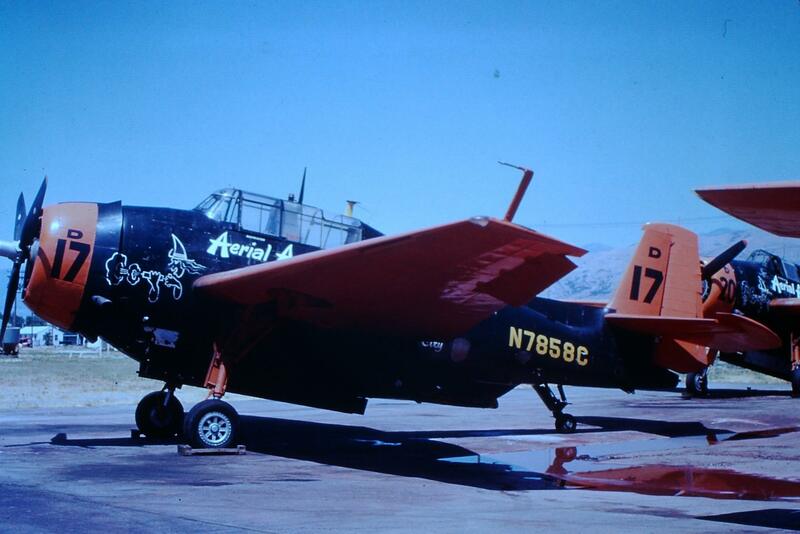 I was flying for Agair when this a/c arrived, still in the colors it had before Hicks and Lawrence. It was stripped of the black paint in 79 or 80. Don Lumsden (the owner of AgAir) passed away about a year and a half ago. http://www.airport-data.com/aircraft/photo/000401425.html. The link shows a photo of C-FQBT residing at the North Peace River Regional Airport (YXJ), Fort St. John, British Columbia. The photo of C-FQBT is dated 2009-06-02 and shows the aircraft without rudder and ailerons. It is apparently owned by James B. Wilson. A high resolution Google Maps (2014) view of North Peace Regional Airport (YXJ), Fort St. John, British Columbia, shows an Avenger with wings folded. It is behind a small white building with a red Twin Otter beside it. 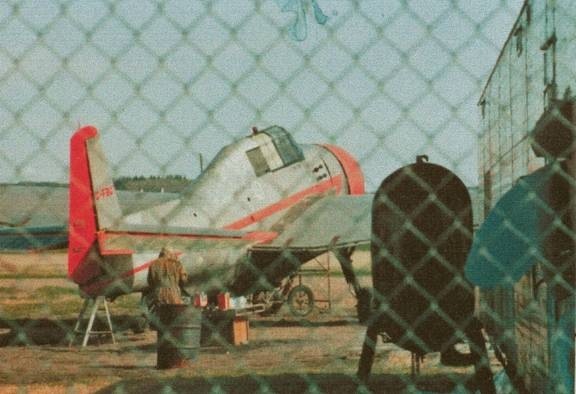 This is pretty good evidence that the aircraft is not at Ag Air Ltd, Dawson Creek, BC, or the Canadian Aviation Hall of Fame (Reynolds Museum complex), Wetaskiwin, AB.